For some reason, the Lady Titans had their hands full with the Moffat Cowboys on Saturday, February 7. 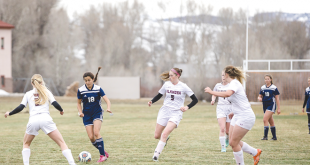 Earlier in the season, Crested Butte beat Moffat by 21 points but things were much different this time around. For one, the Lady Titans were forced to play without senior post player Jessie Frame. 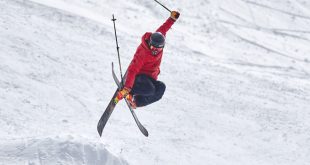 Frame’s leadership was missed and Moffat’s size inside proved troublesome for Crested Butte. Second, Moffat picked up a couple players since the last time the two teams met and were able to mix up their play both on offense and defense handing the Lady Titans a bit of a surprise. And finally, senior point guard and Lady Titans scoring leader Emma Vosburg was forced to sit most of the third quarter with four fouls. Fortunately, the Lady Titans ultimately rose to the challenge putting together a solid fourth quarter to pull away and seal a 55-43 win. The Lady Titans opened the game with a full court man-to-man press that flustered the Moffat squad. Both Vosburg and senior Allie McFarland scored easy buckets off turnovers created by the Crested Butte press. After junior Sydney Loyed buried a 12-foot jumper to give the Lady titans a 12-5 lead six minutes into the game, it appeared as if it would be an early Crested Butte rout once again. But the closing two minutes of the first quarter deteriorated into absolute chaos and Moffat battled back to within two points by the end of the quarter. Crested Butte regrouped for the opening five minutes of the second quarter going on a 11-4 run to rebuild their lead but Moffat battled back again to cut the Lady Titans lead to three by the end of the first half. Crested Butte returned to their man-to-man press and opened the third quarter with three quick buckets including a 14-foot jumper by senior Allie McFarland to build a 31-21 lead. Yet, once again, Moffat refused to relinquish the game. Vosburg picked up her fourth foul with five minutes left in the quarter and things started to get a little out of hand. Junior Sydney Loyed did her best to lead the Lady Titans offense as Crested Butte relied on hustle to hold off a third quarter comeback by the Cowboys. Adding insult to injury, Crested Butte shot zero for seven from the free throw line in the closing minutes of the quarter and the Lady Titans had a slim four-point lead with one quarter left to play. Despite the scare, coach MaryMike Haley had faith in her team on the floor. Vosburg returned to the floor in the fourth quarter to help lead the Lady Titans on a 13-3 run. Sophomore Shannon Holleran crashed the boards repeatedly for rebounds and Vosburg came up with back-to-back steals as the Lady Titans pulled ahead 47-35 with four minutes left in the game. McFarland ran coast-to-coast for a lay up and Holleran capped the game with a bucket inside following a Lady Titans press break for the 55-43 win. Vosburg led Crested Butte with 22 points, McFarland had 12 points and eight rebounds and Holleran and Loyed each scored nine points and pulled down 10 boards. The Lady Titans are now 13-2 and are in the top spot of the Southern Peaks league with three more games left in the regular season. Despite the win, Haley sees a formidable challenge ahead for herself and the team as they prepare for the post season in two weeks. The Lady Titans have another test coming up this Friday, February 13 at home when they host the second place team in the Southern Peaks league Sierra Grande. Tip off is at 4:45 p.m. at Mt. Olympus. The Lady Titans then face Aguilar in their final regular season home game on Saturday, February 14 at 1 p.m.